Originating from South America the apple snail species of Pomacea, commonly referred to as golden apple snail, was imported into Vietnam from 1985 to 1988 with the intention of raising it for human consumption. 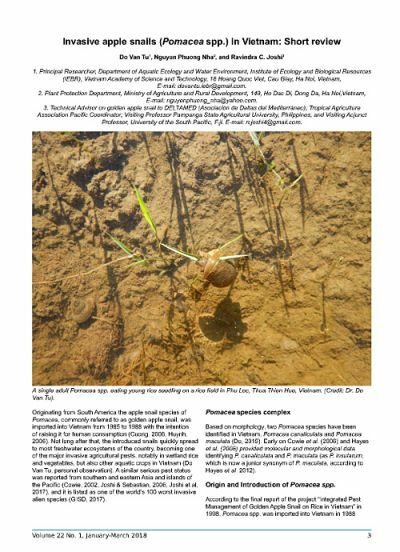 Not long after that, the introduced snails quickly spread to most freshwater ecosystems of the country, becoming one of the major invasive agricultural pests, notably in wetland rice and vegetables, but also other aquatic crops in Vietnam. A similar serious pest status was reported from southern and eastern Asia and islands of the Pacific , and it is listed as one of the world’s 100 worst invasive alien species. 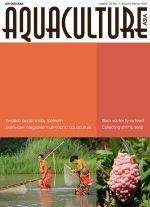 This review examines the current status and history of apple snail introduction in Vietnam, and the various control and management measures used to cope with snail infestations.